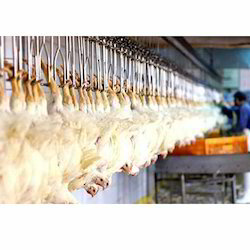 We are manufactures of Chicken Processing Unit. We take turnkey projects in this field many plants are erected by our company in India and abroad. We have in house manufacturing facility in our factory for Blast Freezer, Plate Freezers, IQF, Chillers, and all other equipment required for cold storage. The birds arestunned, dressed and chilledin most scientific most hygienic manner. Birds From1.0 Kg to 3.0 Kg. Looking for Chicken Processing Unit ?